My entry for "Twinkle" is "Starfire Galaxy" - I chose this piece because it is full of twinkling stars. A Punch of Color in a Starfire Galaxy. 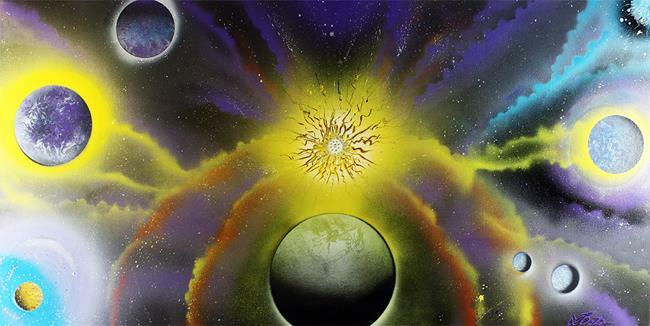 A Fantasy Space Painting created with Spray Paint on Canvas by Laura Barbosa. "My new techniques in spray painting are achieving far beyond what I expected them to. I love how all the colors blend together in this piece and their contrast is very interesting. The light blending of the starburst into the black universe really pops this artwork. I am practicing new effects every day and am hoping to come out with something very special each time I spray. This original painting was a custom commission for clients who love outer space art." Thank you for supporting my work!